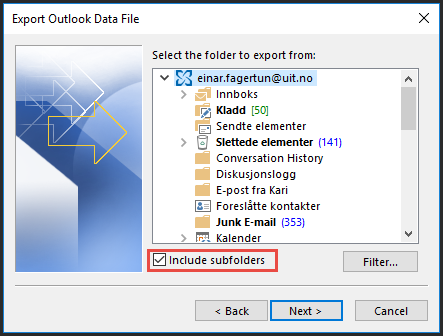 Outlook supports exporting all emails and calendar items to a file that can be opened at another computer. This is useful if your time as a student or employee at UiT is coming to an end, but you wish to keep your emails. If you move all the emails you wish to keep to a single folder, you only need to export this one folder. 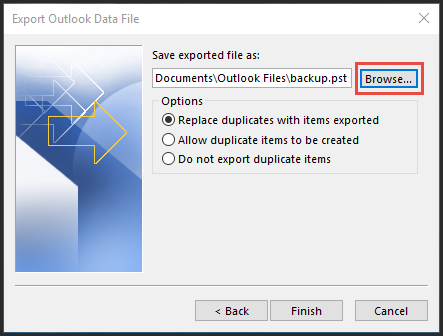 Choose "Export to a file", and then "Outlook Data File (.pst)". Ensure that "Include subfolders" is chosen, and click "Next"
Choose where you wish to store your archive file by clicking "Browse", then click "OK". If your association with UiT is coming to an end, you may wish to store the archive file to a USB drive or an external harddrive. Click "Finish" to save the archive file.